Located in the Heart of Speyside, in the North-East region of Morayshire, BenRiach – meaning ‘Brindled Mountain’ – has quietly built its reputation as Scotland’s most experimental and innovative distillery. Built by John Duff in 1898, BenRiach displays all the traditional charm of a Speyside distillery, and though it lay dormant for 65 years, our super premium Single Malt Scotch Whisky has continued to capture the curiosity of enthusiasts around the world. At BenRiach, we draw the spring water to make our whisky from the Burnside Springs. It starts its journey far underground in the Cairngorm Mountains and makes its way to us through a bore hole that travels up from deep below the distillery. The high mineral content of the water adds to the unique quality of our whisky. We ensure that only the finest spirit is filled into each cask and that only the best casks are selected to enhance the exceptional character of The BenRiach. Deep in the still and the darkness of the traditional dunnage warehouses at the distillery, row upon row of the finest oak casks rest, slowly maturing, awaiting the day they develop the classic Speyside character and the light, fruity, fresh-barley sweetness of The BenRiach. The uninterrupted inventory of exceptional Speyside Single Malt in our warehouses dates back as far as 1966. The whisky distilled at BenRiach lends itself beautifully to finishing, and we have become known for our outstanding and innovative range of cask finishes. As we choose a longer finishing time than is common at other distilleries, cask-finished The BenRiach benefits from what is almost a ‘double maturation’. An eclectic mix of casks, varying in size and origin, take their final rest in the legendary Warehouse 13 – the oldest warehouse to remain at the distillery, and the most revered. Unusual for a Speyside distillery, The BenRiach whisky is distilled from both non-peated and peated malted barley, allowing us to capture the defining taste and aroma of peat in a few unique expressions. Peated The BenRiach is, in fact, a return to the original Speyside character and flavour of malts typical of the nineteenth century, and uniquely, this is the only Speyside distillery with a history of such a highly peated style, dating back to 1972. We are fortunate to be one of only a few distilleries in Scotland with our own operational floor maltings. Having been out of commission for 14 years, our floor maltings have been operating seasonally since 2012. Bringing the floor maltings back to life offers us the rare opportunity to, once again, produce whisky in the traditional way – the malting of the barley, distillation of the spirit and the maturation of the casks all happen on site. 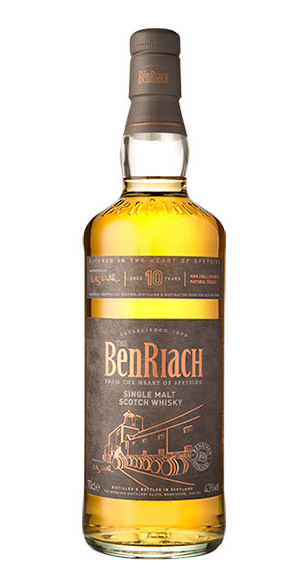 This will be an exciting addition to the future range of The BenRiach expressions. Although we don’t use the floor maltings for all of our production, we always insists on locally sourced barley, which is purchased and malted in a neighbouring village. The BenRiach whisky is testimony to the many years spent building its reputation, stretching back to the 19th century, and it reflects the skill, knowledge and experience that has gone into the making it. Of the distilleries in Scotland, few hold such a history and even less today have such an exciting future.